The over-riding requirement when planning any cruise around the Island, and particularly from the club's premises at Gallows Point, is a set of Tide Tables! North Wales is one of those places where, without them, you might as well stay at home.The Sailing Directions for the region (Cruising Anglesey) contains a Tidal Atlas of the Menai Strait based on local knowledge, whilst online predictions are available from Bangor University and the Admiralty. Use the buttons to go to each of these sources. “Phil’s XL” downloads and saves a spreadsheet developed by Club member Phil Orr to your Downloads folder. Open it from the PC. 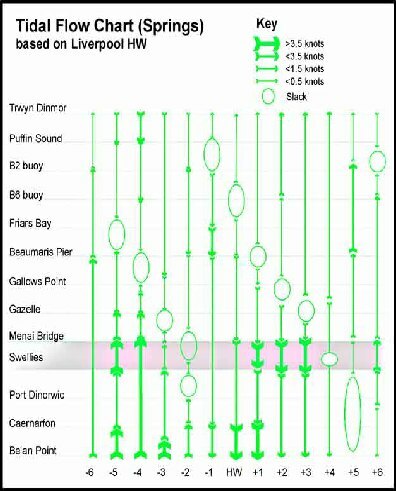 A number of factors contribute to Anglesey tides, perhaps the most significant being the meeting of up to five tides at the one place (in several places!). Constricting the tidal flows of the Irish Sea into the confines of the gap between Anglesey and Isle of Man, Bardsey Sound, River Mersey and the Menai Strait doesn't help. In the particular cases of the Menai Strait and Bardsey Sound, the tide is still flowing out of one end when it is entering the other - resulting in water level differences of over a metre, and a serious downhill torrent. For similar reasons, HIGH water and SLACK water do not always coincide, this being most apparent in the Menai Strait. In case you need to know when it goes dark! The Sunrisesunset web site prints monthly calendars for both sun AND moon, and you can choose between astronomical, nautical and civil twilight times. They have details for Holyhead. Tide predictions, with Moon phases, for locations around the world. Full year available.